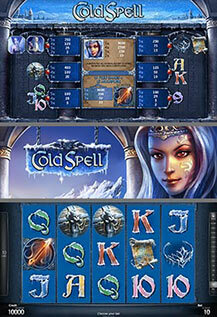 A "Cold Spell™" lies over the realm – and you alone have it in your hands to break it! Enchant the fire magician and her magic wand with this new 5-line, 5-reel video game and see how the warm light brings life to the land. The noble king will reward you with gratitude and wealth! FIRE MAGICIAN substitutes for all symbols except WAND and doubles prizes when substituting. 3 or more scattered WAND trigger 15 Feature games with all wins multiplied by 3. Feature games can be won again during the Feature games and are played at current bet.